I am lucky to have parents that love to work the land, I know that my inner farmgirl runs deep through my family history. My Mom has always had a green thumb when it comes to flowers, and all things that bloom in yard. She helped cultivate a love of so many beautiful things in the garden, and my Dad helped me learn to love growing things in the edible garden, both of which I am grateful for, truly the best of both worlds! Choke cherries :). I also scored a few raspberry bushes that he dug up, I can't wait to get them in the ground here in my own garden, a little piece of joy from Dad's garden to mine. :) Have a beautiful day. 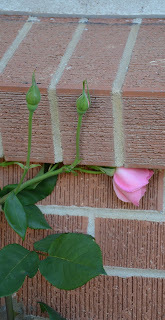 Things are really starting to grow in the garden now, almost everyday I have fresh new roses to clip, and tons of herbs! The heat is a bit trying, but I am managing it alright for now. Some of my experimental crops are not doing so well, the tobacco never really took off, and the cotton is trying to do something but it seems a bit stunted, but that's okay, the asparagus is out of control !!! Here's a long view of how the canvas of my yard has changed. I have all the new beds, new stepping stones, the bark laid down, and things growing like crazy! I love it! Here is a shot of the first bell pepper to be coming in. This is a plant that I got from my friend Marsha, this strong little guy is really happy in dirt! I'm super excited to watch this one grow! My corn field is a little strange this year, I mixed some of the sweet corn seeds up from 2 separate companies, and it looks like only on variety has taken off. I love watching the corn grow, it grows so fast, it changes daily! Since I had some empty spots in the corn field, I put in some tomatoes and squash. The squash plants are also a gift from my friend Marsha, there are many varieties that she gave me, some I have never grown, so it should be exciting to see what comes up! As always, Arty laying around in the yard....cats are the coolest. I officially have pumpkins starting on the vine, YEAAAA!! This is very exciting for me since I have lost all my pumpkins in the last two seasons! Keep your fingers crossed!! My Mom pruned this rose bush back to nothing this spring, in the hopes of removing it and planting in another spot. Its so close to the house I wanted to move it where it will have room to grow, but it seems to be super happy and just fine right here. Its has grown over 3', and is blooming right up to the window. I noticed this one rose blooming even though it was cramped and growing right up underneath the windowsill, I tried to move out from under there, and the next day it was right back where it wanted to be, under the windowsill. As you know, often my garden and yard make me reflect on my life, this reminded that if we just be who we are, we will find what we need to bloom no matter where we are! Yay for roses!! Things are starting to get moving in the pumpkin/melon patch, I am so happy, I thought these were going to die off for a little bit there, but they are coming back strong. I am hoping for the best over the next few months. It has been about 3 years since I had a decent pumpkin patch, and I just can't wait !!! My cherry tomatoes are also going strong, I love these so much! 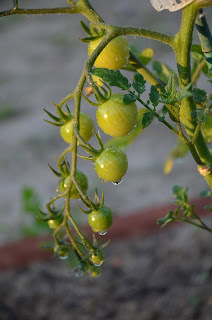 I have stolen a few of them here and there as I work in the garden, fresh tomatoes are my favorite thing in the garden! I love the smell of the plant, the taste, and just the super juicy freshness that comes from these bad boys!! 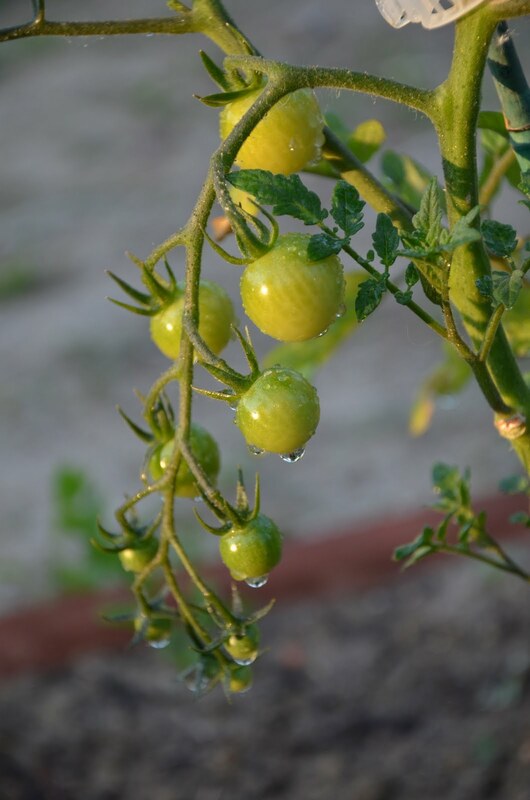 The tomatilloes are about to be out of control as well, woohoo! I had to bring some of the outside beauty inside, naturally, pink roses and sage flowers did the trick! My sage is out of control and about ready to harvest, another of my favorite plants in the garden, I love its purple flowers, big bushy leaves, and of course the smell! So wonderful not only for outside but for inside too, cooking and burning this plant as in incense fells like a little luxury :). 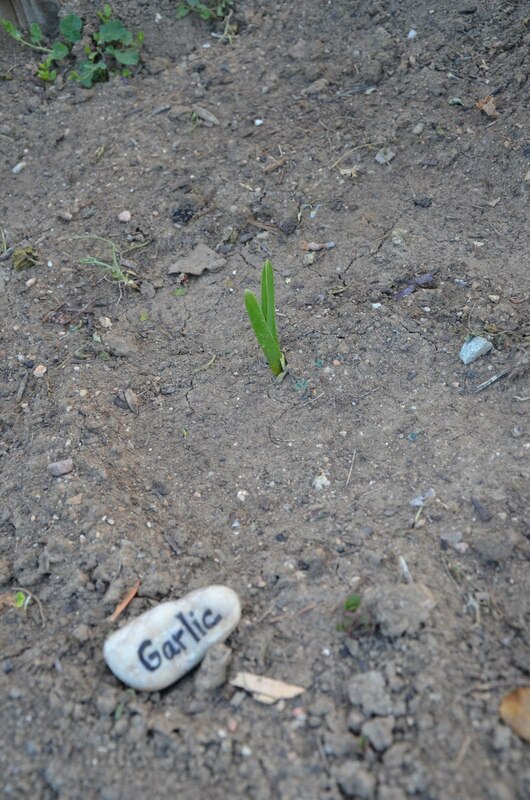 I have always wanted to plant garlic, I mean there have been plenty of times I have found a little garlic bulb kinda growing inside the house, but this year I wanted to give it a try in the dirt! 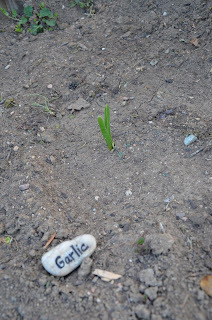 I am a little worried that I am going to get addicted and need to plant a whole bed of garlic now that I have one growing.....heeheee like thats a bad thing right. That about all the garden shots for now, I have more to post, the corn is growing, the asparagus, potatoes, all the peppers, and even the cotton is doing a little something :). More to follow for sure! 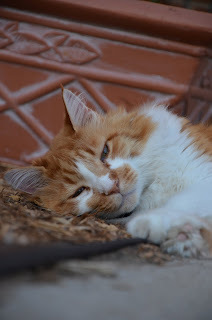 As always, Sir Artemis followed me around and had to jump into a shot. I was all set up because it was dusk and not very light out, I was setting up to be very still for the shot, he just wandered on in to stretch it out a bit. I love that you can see the moon hanging in the background over the neighbors house :). I hope your all enjoying every minute, it's all going by so fast, slow down to love and take in the beauty of everyday. I love my yard :) even though I am incredibly sick right now, after 10 days of taking it easy I had to get out there and do some work. It makes me so happy. TEEHEE!!! One of my sign customers brought a big sign in that we needed to cut down, and I trimmed this little corner off and took it home :) hehehehehe I love it!